Marshall Audio Production Accessories. Stereo Lip SYNC Corrector,HDMI Audio Extractor and HDMI Audio Inserter. 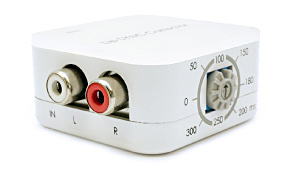 Synchronize your audio and video, correct audio delay between audio and video, extract audio signals from your HDMI source. Output your audio signal to external speakers or extend your audio signal. The Stereo Lip SYNC Corrector is a compact device that corrects audio delay between audio and video. When distributing video over long distances through multiple devices like distribution amplifiers and set top boxes there can sometimes be a noticeable delay which results in audio being played before the video. This device lets you manually adjust the audio delay from 0 ~300 ms allowing you to perfectly synchronize your audio and video, so when it reaches the display your media is synched and ready to go. The Lip SYNC Corrector is an affordable and compact device that can be used to correct audio sync going to your Producers Station audio inputs. 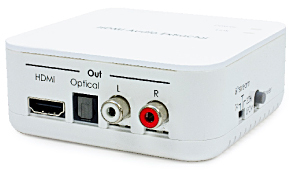 The HDMI Audio Extractor is a device that allows you to extract audio signals from your HDMI source. 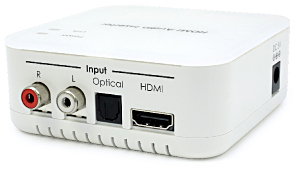 When connecting with a TV or display you don't always get great audio, or in the case of a display, no audio at all, so with this Audio Extractor you can take your original HDMI audio signal and convert it to optical and analog L/R audio. What this means is that you can output your audio signal to external speakers or extend your audio signal. The HDMI Audio Inserter is a device that lets you insert external audio into your HDMI/DVI source. The device allows you to insert stereo and multi-channel surround sound to give users the capability to select and insert their Sweetened audio formats into the HDMI program feed.